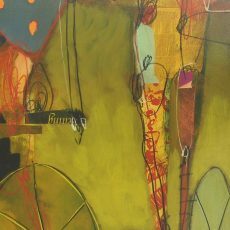 Born in Colorado Springs in 1969, Sanford Wakeman moved to Greenville, South Carolina before the end of his first year. A close family and the youthful experience of a small town helped nurture Sanford through his teens. Although a small city, Greenville was large enough to offer him the opportunity to study printmaking and drawing at the Greenville Fine Arts Center, where Sanford also developed an early interest in photography. Scenes of graffiti and buildings in disrepair were the subjects of many of his early works. The conjunction of form and color in these urban images would have a significant influence over his later creative expressions as well. Sanford’s unique, boldly abstract portfolio gained him entrance into the Fine Arts program at the University of Georgia. He continued drawing and added painting and sculpture to his repertoire as well. During this time, Sanford had the opportunity to return to Colorado and live in the Rockies. This solitary immersion in nature, as well as the difficult death of his grandfather, greatly shifted his life-perspective, and caused him to choose art as his full-time career. Upon graduating, Sanford worked the night shift at a packaging plant. Amidst all the functioning machinery, he tapped into a surreal sense of vitality – a life and spirituality within the non-living. In his artwork, Sanford began to simulate that mechanistic organism living within the inanimate world. When Sanford earned entrance to the Savannah College of Art and Design, he concentrated on color theory and drawing. His education at this prestigious institution lent maturity and individuality to his artwork. Equally important to his artistic growth were his impressions of and interactions with the city’s culture. Just as the production plant had contained myriad mechanisms working both with and against one another, Savannah was full of cultural and aesthetic contrasts. As a result, Sanford’s compositions became saturated with intriguing juxtapositions. Ron Kempton The abstract paintings of Ron Kempton are as varied in texture as they are in style and design. Using acrylic as his favored medium, Kempton's body of work ranges from large, action-field canvases to bold, abstract geometric designs. The artist's large, action-field canvases are the ultimate in contemporary, ranging from deep, seductive hues to vibrant gem-like colors. These abstract designs often generate what appears to be a light growing from deep within the painting's surface. Kempton's geometric series is equally impressive, varying from robust earth shades to brilliant, bold tones. The artist uses blocks of pure color against contrasting fields to create a uniquely intense palette. Slaymaker Fine Art Ltd. is proud to have represented Ron Kempton for over a decade. His work is collected throughout the world and is found in numerous private and corporate collections. "Santa Barbara Aspens" in the Originals New Mexico Show, 2007.